What Wood for Building a Dock? Building a dock requires wooden components that can stand up to the elements and near constant contact with a body of water. Not all types of wood are suitable for dock construction. Porous soft woods make poor material choices for dock construction, while hardwoods may require specialized treatment to last in a body of water containing a high salt content. Choosing the wrong wood can result in a dock that decays quickly. The type of wood chosen to construct a dock directly influences the platform's longevity and ability to withstand constant interaction with the elements. According to Fisheries and Oceans Canada, the best wood boards for building a dock are Western red cedar, redwood, cypress and eastern white cedar. Permanent dock piles or dock cribs should use stronger hardwoods, including Douglas fir, tamarack and hemlock. Western larch, spruce and pine can substitute in the construction of permanent piles when the previously mentioned hardwoods are not available in sufficient quantity. The water source surrounding a dock plays a role in the type of wood used in its construction. According to Building Products Plus, a timber-supply company, pressured-treated lumber is necessary when constructing a dock in a freshwater or saltwater location. However, harmful chemicals can enter the water supply from the chemicals used in making pressure-treated lumber, so a builder must be careful in choosing it. The EPA sets minimum retention-rate standards for treated lumber used in different water environments. The retention rate refers to the amount of preserving chemicals the wood holds when it's in use. Pressure-treated lumber at a retention rate of .60 pounds per cubic foot (PCF) is the minimum measurement when constructing a dock in freshwater. In saltwater, pressured-treated lumber at 2.5 pounds per cubic feet is the minimum for building a dock safely. Dock construction must include some metal components to reinforce wooden parts and provide a sufficient anchor into the water body's floor. According to Building Products Plus, a builder should use stainless steel, galvanized steel or a metal specifically treated to resist corrosion in a marine environment when constructing a deck in saltwater or freshwater. These metals should also comprise all screws, nails and bolts used in construction. 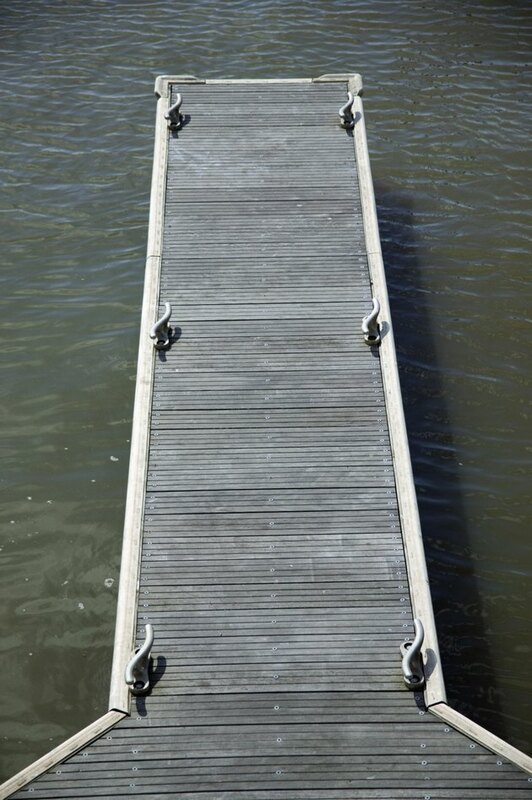 The proper metal helps preserve the structural integrity of the dock and acts as a safety mechanism in the event wooden components break or crack. Painting and sealing wood components of a dock only provides temporary protection against wood rot and the degradation effects of constant water exposure. These coatings can peel and blister, causing water to enter underneath and hasten the rotting process. A dock constructed without pressure-treated lumber may require constant maintenance and monitoring to ensure wooden components are not degrading at a rate that could endanger the dock's structure. What Screws Do You Use With Treated Wood? What Kind of Wood Is Waterproof?